This past weekend I posted a photo of the mist from Victoria Falls. Photos from the Loonybin asked if I had any photos of the actual falls. Here is the photo from the top of the falls. Tomorrow I will post a photo that I took on the other side of the falls that actually shows the waterfall. This entry was posted in Africa, Travel, Travel Photos and tagged Africa, African Rivers, Nature, Photography, Rivers, Travel Blog, Travel Journal, Travel Photo, Victoria Falls, Waterfalls, Zambezi River, Zambia, Zimbabwe. Bookmark the permalink. Thanks! The water moved so fast. They have signs everywhere saying don’t get into the water. But I didn’t need the signs. The water scared me enough. This photo is so beautiful!! Waterfalls are so pretty…great capture of the rainbow. Wow, you’re so lucky to have been there! Great shot. I hope you like the photo tomorrow as well! really amazing photo TBM, fantastic!! Thanks Xandi! It is an amazing place. Beautiful shot with the rainbow! I was happy to see the rainbow! Thanks T.F! I didn’t know what to expect when we were planning the trip. It was more beautiful than I imagined. I loved the rainbows and the mist. It was somewhat difficult to get a photo from the other side due to all of the mist. this photo gives me the shivers! if that is the crest at the top of the famous Victoria Falls, it is the precipice, the edge over which there is no return! it reminds me of going to Niagara as a little boy and being mesmerized by the swirls dancing over the edge, then plunging . . . it felt as though it were calling to me–it scared and exhilarated me altogether. I look forward to tomorrow’s! It is amazing to witness nature when it is so powerful. The water crashing down over the falls was a sight to see. Niagara is another beautiful waterfall. I love your description of it! Gorgeous picture, I’m very jealous, you got two things from my ‘bucket list’ in one shot…waterfall and rainbow! Lovely, thanks for sharing. 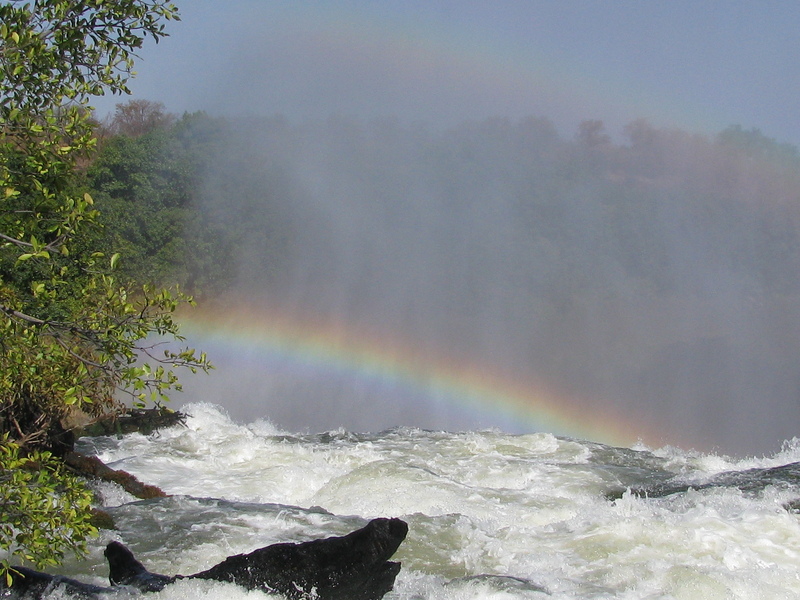 🙂 From what I hear, you have a great chance of seeing a rainbow over Victoria Falls. Thanks Nigel. Oh dear, this is so fascinating! I wish I was with you when you were taking the picture! That’s so beautiful! It has a fantasy/magical feel to it. It was cool to see! Thanks! I looked at your tumblr page and saw some flowers there. Are they cherry blossoms? They are beautiful. That rainbow is stunning! You could certainly make a wish on that one. It must have been an amazing experience to see the falls. Can you get up close to them like you can at Niagara? You can get pretty close and you can even walk through some of the mist, but you get soaking wet. I didn’t do that since I had my camera. I saw the people going into the mist. On the side of the falls, if my memory serves me correctly we were extremely close. I’m having a hard time remembering how close I could get to Niagara. We did a river cruise the night before and got pretty close to the top of Victoria Falls–as close as was safe. That was cool. I imagine all of the humidity is dangerous for the camera anyway. I think you can also go behind the falls. That would be awesome to go behind them! Rainbows are just fun to see!